Der Osten and Der Westen come from Berlin, Germany, originally from Madrid, Spain, which raises the obvious question why Der Osten and Der Westen sing in German. With the given reactionary club culture based on punk socialisation, the future-objectors Alfred Bierlek and Wolf Dosenbiermann, Der Osten und Der Westen respectively, reach for the most modern means of production in order to distribute secret prophecies of timeless meaning to the people. 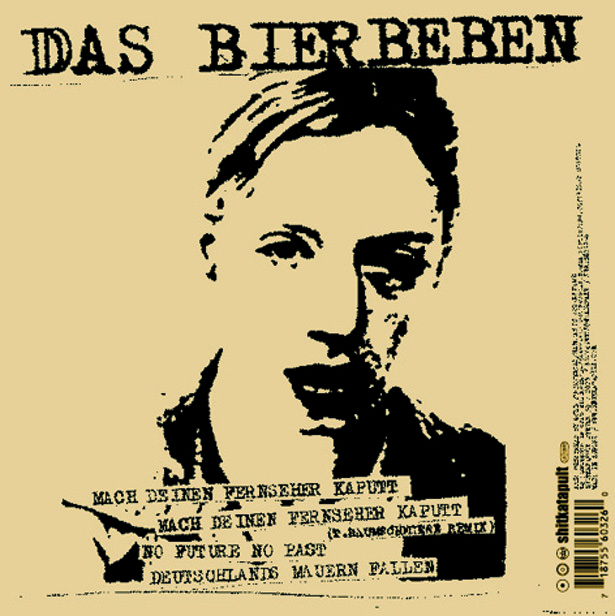 Das Bierbeben operate tactically with repetitive electro beats and synth-pop appeal in the same vain as one once had to hear a JudasPriest record backwards to decode the satanic verse. On top there are few but poignant verbal messages with which the ensemble beam their listeners into a time warp that diminishes somewhere in a deja-vu interval between two Jaegermeisters. All this at a time when the DDR still existed, when watching TV was retarded, and when the future was a beer can away. „Schlag deinen Fernseher kaputt“ is such a timeless formula that will probably never lose its validity. The piece moves along quite innocently decorated with classic electro-trash elements and guitar samples, but most of all, indebted to the candy-apple voice of the female singer “der Osten (??)”. These are precisely the disclosed tactics of das Bierbeben. The message is definitely not blunted but instead works with the approach of the enemy – perhaps a sponsor’s message for the right product? T.Raumschmiere’s Remix sounds more like a pirate station’s but maybe just more sacred: filtered twice as much and manipulated, rushed as if being chased by depressive beats, or as when only the destruction of your TV could solve the situation. „Wenn Deutschlands Mauern fallen I would like to be there” is what blares from the time space warp. The driving beat is plowed forward in the best Shitkatapult manner, of course tapered with all sorts of thwarted and sometimes bizarre ideas. As for the message: ignorance can also be a form of self-preservation; maybe the reunification never happened.